With the official first day of spring — March 21, that is — right around the corner, many backyard gardeners are jumpstarting their summer vegetable gardens in greenhouses, cold frames, or indoor seed trays. Not feeling up to planting and tending? Take the slacker route and start foraging. Depending on where you live, the season's first dandelion greens may already be busting through the ground, just waiting for you to pick 'em. Dandelion greens aren't just beloved by the likes of Euell Gibbons; in such countries as Britain and France, they're traditionally made into soup and savory tart fillings. If your lawn isn't made of AstroTurf, chances are you'll have dandelions out there. If you don't have a yard, many markets sell bundles of the leaves, already picked and neatly bound. 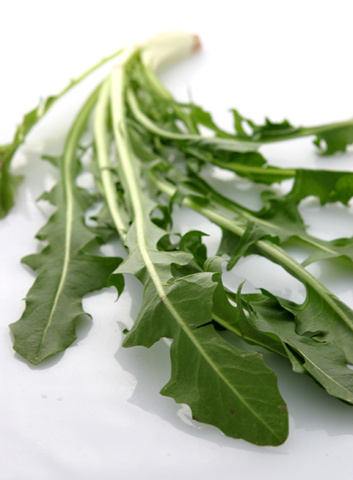 The best time to eat dandelion greens is in the spring and early summer, when the leaves are still young. As with many greens, the longer dandelion leaves are in the ground, the more bitter they become. So pick them young, give them a good rinse (try to avoid harvesting them along busy roads), and cook them as you would other bitter greens, such as arugula or chicory. Jeannette Ordas, of the Vancouver food blog Everybody Likes Sandwiches, recently made a salad of market-bought dandelion greens, topped with a hot balsamic dressing. Although she enjoyed them, next time, she writes, she'll sauté them in order to cook off some of their inherent bitterness. Other Culinate-featured food bloggers who've enjoyed cooking with dandelion greens in the past include Lisa Dillman, of  Restaurant Widow, and Stephen Smith, of Stephencooks.